It seems like Lethbridge spent a lot of the year covered in either snow, which didn’t leave until April or smoke, which do minated the summer, or surrounded by howling wind, but it was still an exceptional year for live music in the city. On a sad note, CKXU’s Love and Records festival took a break from Galt Gardens this year due to volunteer burnout and the staff being focused on getting the new 2,900 watt transmitter operational, which happened at the beginning of December. University of Lethbridge based radio station CKXU 88.3 f.m.’s new transmitter was a major highlight for those people looking for music you can’t hear anywhere else. This year, lots of excellent live music came to the Slice, Owl Acoustic Lounge and Average Joes and the Smokehouse, to name a few. There were lots of afternoon shows this year including the LGRC family jam at the Owl who also hosted The Folk Road show for a matinee during the summer and other assorted afternoon shows. The Smokehouse also started a matinee series featuring folk and roots music. Blueprint Records also closed after 12 years supporting the local scene. Before handing the torch over to new owners Street Legal Records, they held a big farewell bash at the Slice, June 1 featuring lots of local acts Biloxi Parish, Sparkle Blood, Open Channels and Mombod. The next night Street Legal held a grand opening bash featuring rap and hip hop. The Geomatic Attic had an excellent season full of blues with shows from Steve Dawson, Dawson playing with Kat Danser as well as Birds of Chicago and Joey Landreth, Nov. 25 who was also a hit opening for the Sheepdogs at Whoop Up Days. MonkeyJunk returned to the Geomatic Attic to slay on May 24. They had an excellent run of shows in May, featuring a beautiful show of folk with Fionn and Royal Wood, May. 22. Earlier in the year, they had the White Buffalo, March 6. 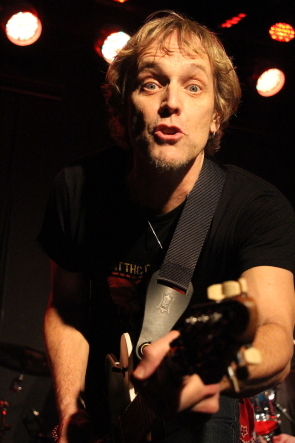 He is best known for writing several songs for the TV Show Sons of Anarchy, and Tri-Continental brought their cross-cultural music right before that. Honker’s Pub celebrated 21 years with a lot of live music on March 17. The Enmax Centre had a lot of big shows this year including Shinedown, Johnny Reid and a lot more but I only made it to George Thorogood and the Destroyers, who rocked the joint, May 5. There were also several alternative rock shows this year downstairs in the old Firehall hosted by the Terrific Kids Collective, who held shows for Halloween and other shows throughout the year. As always there are new bands forming and playing, it seems every day. Some of the highlights this year were up and comers Hoverkraft, Gabe Thaine in his many incarnations like the Crooked Creek Warblers or solo, Silkstones and Biloxi Parish. I have a pretty eclectic taste in music. I listen to bands even hipsters haven’t heard of, I know this for a fact because pretty much nobody recognized any of the bands I was irritating people with by raving about over the past couple months leading up to my voyage on the Norwegian Pearl for the Outlaw Country Cruise 3, Jan. 21-26. Some of my favourite bands barely ever play Canada and are never played on modern radio but were playing the Outlaw Country Cruise 3 sponsored by the Outlaw country station on Sirius XM. While the station plays your usual diet of Merle Haggard, David Allan Coe, Waylon Jennings and Johnny Cash, they also play a lot of up and coming “outlaw country ” musicians, Southern rock, punk rock and cow punk , roots rock , alt country and other music that just doesn’t fit in, so the bands on the bill reflected that diversity. 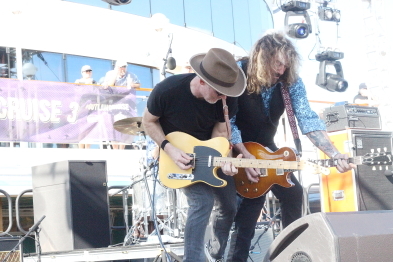 Some people recognized Steve Earle and the Cuban influenced country band the Mavericks, who were the “headliners” on this bucket list cruise which was basically a gigantic music festival taking place on six stages on three different levels of a monster cruise ship sailing from New Orleans to Costa Maya, Mexico. A couple people vaguely remembered the Bottle Rockets, Jason and the Scorchers and Blackberry Smoke because they heard them on my shows on CKXU 88.3 f.m. And even though Steve was the headliner and playing numerous times (and for the most part completely different shows) during the week like most of the artists, I only caught bits and pieces of his shows including the Copperhead Road show, because they were competing with other bands I really want to see who rarely, if ever, tour Canada. And I know Steve would put on a great show because I’ve seen him play here. 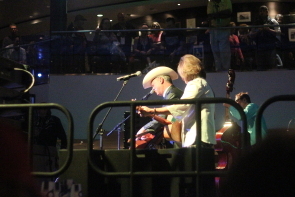 He was one of many Texas musicians playing on the ship. I got to sit in on a couple of Outlaw country broadcasts including Steve Earle swapping stories about dearly departed Guy Clark and Nashville in the early ’70s. I also got to see an excellent workshop featuring Steve Earle, Rodney Crowell, Ray Wylie Hubbard and Lucinda Williams swapping songs and telling stories, which was excellent and kept my attention off the floating city being blown back and forth by 50 knot (approximately 100 km/ hour) gale force winds, which while I may be used to them in Lethbridge, is a little disconcerting in the middle of the Caribbean Sea. Usually I’m in the front row, right next to the stage for almost every show that comes to Lethbridge, making pictures and taking notes in the endless quest to let people know that there is a whole world of great music just waiting for you discover beyond the banality of modern Top 40 radio, so it was weird to just be part of the masses just sitting back and watching the show. Other than the Bottle Rockets, even I stayed at the back of the room, and barely took any pictures, not wanting to pack a telephoto lens (which were “not allowed” though some people brought them). It was a weird unsettling feeling, but the trip of a lifetime — like I said bucket list. Every morning, they crew would deliver a schedule of cheerful welcome brochures and portable schedules of all the fun planned for the day which you could carry around on a lanyard along with your cabin key which you’d have to use to get drinks and of course get into your room, to choose the shows you wanted to see and the pieces of shows you could catch if they were competing with each other. Fortunately the stages weren’t that far apart, so it was easy to catch a little bit of everything. As always, I went to a lot of shows this year, yet not as many as I would have liked due to other commitments like family and theatre. Here are some of my favourites by the month. Jan. 6 —One of last shows at all ages venue Attainable Records and the last show for local punk / alternative rock trio Advertisement raising money for Lethbridge Shelter. Jan 21— One of my new favourites, Edmonton musician Kimberley MacGregor played several shows this year including one of several songwriters in the round. She played the Owl Acoustic Lounge with the Silkstones, Elliott Thomas and Burning Bridge. Jan. 26— Michael Bernard Fitzgerald played sold out solo show at Geomatic Attic. he’d return later in the year for a sold out show at the Slice with a full band. Jan. 28— Edmonton based, Newfoundland born celtic rock band the Derina Harvey band rocked the Slice Celtic style with upbeat Celtic rock music. They return to the Slice this January. 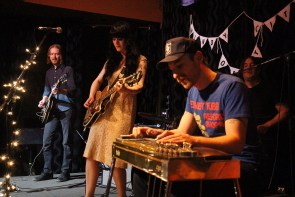 Feb. 8— Boots and the Hoots playing one of many excellent Windy City Opry shows at the Slice. Feb. 10— The Owl Acoustic lounge started adding spice to their Monday open mics with touring hosts, this time with Kayla Luky and Rotary Park hosting. Feb. 18—There were lots of laughs with comedian Tom Green at Studio 54. Feb. 19 — As usual, this year featured lots of classic rock. Loverboy was to play the Enmax later in the year, but Honeymoon Suite rocked Average Joes on a Sunday night. Feb. 25— Folk punk band Audio/Rocketry returned to the Slice. Joe Vickers from the band would later play a solo show at the Slice later in the year. Feb. 26— Austin via Halifax and Austin blues band The 24th Street Wailers made their Lethbridge debut at the Geomatic Attic, playing one of three great Southern Alberta shows. 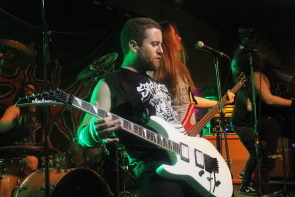 March 7— There was a great rock show with Montreal’s Dany Laj and the Looks with the Dirti Speshuls at the Slice. March 8— Old Man Luedecke ,brandishing his banjo , gave Lethbridge another chance as he returned to the Slice to play for an attentive audience. 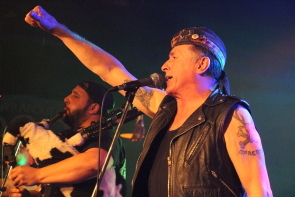 March 16 — The annual pre-St. Patrick’s Day party with the Real McKenzies is always a highlight of the year and definitely March. This year they brought baseball punk band the Isotopes to Average Joes. March 21— Multi-instrumentalist Ben Caplan visited the Geomatic Attic for sold out show. March 23— Central B.C blues rock trio Devon Coyote made a long awaited return to the Owl with a new CD. March 30— Winnipeg grunge/metal band Solhouds featuring Elise Roller of Go For the Eyes rocked The Owl Acoustic lounge. April 21 — Locomotive Ghost played one of several excellent modern indies rock shows at the Slice. April 28 — The Best roots/ folk show of the year in a year full of them was the long awaited return / reunion of Winnipeg Bluegrass/ punk band the D-Rangers who I’ve been following since they formed in Winnipeg/ Kenora back in the day and who took a seven year break. They tore up the Slice with uptempo punk tinged bluegrass music. May 4 — Elliott Brood returned for a packed show at Average Joes. May 5 — Another great show nobody saw was Vancouver rock/ folk musician with Rodney DeCroo and his band at the Slice. May 6— The best blues show everyone missed was Danny Brooks at Slice. 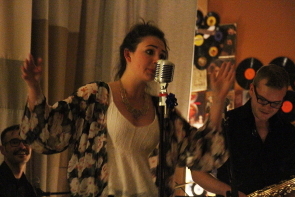 May 11— Another great show from Edmonton’s Kimberley MacGregor and Elliott Thomas at the owl Acoustic lounge. 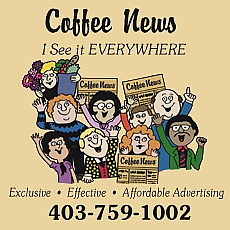 May 12— Edmonton blues rock band the Boogie Patrol always entertain as they did at the Slice in support of CD Man on Fire. May 14 — Average Joes continued a successful run of Sunday night shows with country star George Canyon Average Joes. May 17 Canadian Celtic punk veterans Mahones made long awaited return to the Slice in support of their anniversary CDs “The Hunger and the Fight part One and Two). June 3 — Lethbridge said farewell to talented local singer Mwansa Mwansa who left for Toronto. 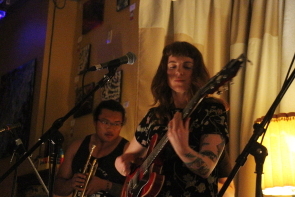 June 3 — Megan Nash returned to the Owl Acoustic lounge with Bears in Hazenmore. It was great to hear her backed by a band. June 3— Calgary pop punk veterans Downway returned to Lethbridge to play the Moose Hall. June 9 —Lethbridge Girls Rock Camp band swap is always a fun event as local musicians mirror Lethbridge the Girls Rock Camp milieu by forming a band, writing a song and playing their first gig in a week. June 14 — Northern Ontario, ukulele powered duo Twin Peaks returned to Owl for another excellent show. 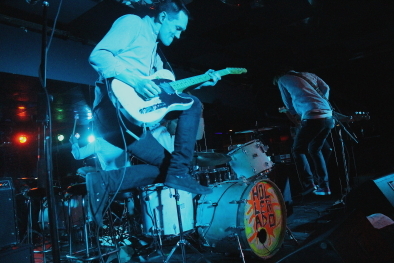 June 16 — It was great to hear Manotick based rock band Hollerado play a smaller venue again as they played a close to sold out show at the Slice. June 17 — Jazzfest is always a highlight of June. While I missed Colin James at the Enmax Centre, I caught Rooster Davis and Ann Vriend at the Owl, June 17. June 24—Prism play the hits at Average Joes in another excellent regular classic rock show. June 23-25 —Rotary Dragon Boat Races featured plenty of local musicians playing in sweltering heat. June 28 — The always fun Matadors played their usual entertaining psychobilly show at the Moose Hall. To add to their devil rock mystique, they added a red clad devil figure overseeing the show in the background. June 28 —the Way Down Wanderers an amazing young bluegrass band from Chicago tore up the Slice in one of several fantastic roots shows at the Slice this year. Twinning celebrations Nikka Yuko Japanese Gardens but I unfortunately missed it and the Amanda Marshall concert at the Enmax which they sponsored. Once again, we appear to be living in interesting times. To reference an old movie, It has been a year fraught with eminent peril — wildfires, floods, smoke, terror,earthquakes, unseasonable weather a nd overall ugliness. Once again, we lost many of our musical icons including Chuck Berry, Tom Petty, Gord Downie, Gregg Allman, Chris Cornell,Fats Domino, Mel Tillis, Malcolm Young and Glen Campbell and Don Williams just to name a few. It has been an interesting one to say the least. The troubles of world be damned, there was plenty of good news on the local scene.There were a cornucopia of great shows, fundraisers and lots of new CDs from local artists including Trevor Panczak, Silkstones, Atomicos, Groove Apostles, Cope, Junkman’s Quire, New Weather Machine and Skinny Dyck’s twenty one nighters compilations plus Tin and the Toad, to name only a few. 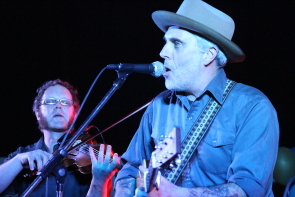 Leeroy Stagger released an excellent new album, “Love Versus,” and started the Dirty Windshields Radio hour on CKUA. Canada celebrated 150 years and both Lethbridge College and The University of Lethbridge celebrated milestone years with festivals. Among the many highlights of the year, Shaela Miller’s concert series the Windy City Opry celebrated a successful year. She also entered the Story Hive video competition in April. She recently competition had a successful crowd funding campaign for her upcoming new CD “Bad Ideas” which is due out early 2018. I don’t think many people will be sad to see the back of 2016 — a year which has basically sucked out loud. I spent most of it recovering from some illness or another. And nothing gets a person thinking of your own mortality and the fragility of human existence than losing musical icons and childhood idols we grew up listening to like Glen Frey, David Bowie, Prince and Waylon Jennings to name a few. Heck 2016 even claimed beloved TV dad Allan Thicke from Growing Pains, who was also a songwriter. The old curse “May You Live in Interesting Times,” seems more apt than usual in a year fraught with terrorist attacks, wildfires, atrocities and tribulations of all kinds. I’d rather accentuate the positive though. I’ve been to a lot of great shows, visited great friends and interviewed some of my favourite musicians. A lot of fantastic local acts performed throughout the year and I only caught a fraction of all their shows. As usual, Lethbridge has stepped up to help those in need with fundraisers and I’ve met many wonderful people. So here are some of my favourite memories. The Owl Acoustic Lounge had most of the month‘s highlights. Peter and the Wolves rang in new year on a toe tapping note at Owl Acoustic Lounge. Up and coming Calgary area singer / songwriter and guitar picker Carter Felker played the first of several shows in Lethbridge this year, with a show at the Owl Acoustic Lounge Jan 8 with Peter Gardner. But the Lethbridge Folk club also managed to heat up winter with a great bluegrass show with Go Ask Earl, Jan. 16 at the Lethbridge College Cave. For folk with more energy, the always entertaining Greg Rekus returned to the Owl Acoustic Lounge, Jan 11. Lynn Jackson played a sweet show of heartfelt blues tinged folk at the Owl on Jan. 28. The month ended with a whole lot of catchy ’80s rock, Jan. 29 as Doug and the Slugs brought upbeat ’80s hits like “Too Bad” to Coyote Joes. The Geomatic Attic was in a mellow mood in February , allowing rockers 54 40 and the Trews to show their slower sides at Southminster United Church, Feb. 2 and Feb. 24 respectively. On a sadder note as it was one I was really looking forward to, Montreal based blues musician Cecile Doo Kingue had to cancel her show at at Plum due to a van breakdown and the death of her mother. But the Slice continued to be a mainstay of the local music scene. They hosted another fun show from Geoff Berner, Feb. 5. Berner would return in September to be a profanity laden highlight of Love and Records. The first of of several big fundraisers in 2016 took place in February as the U of L Opera workshop helped resettle Syrian refugees with a fundraising concert, Feb. 7. The Lethbridge Folk club put on another fun show in February with Boots and the Hoots at the Lethbridge College Cave, Feb. 6. They’d be a highlight throughout the year for people who love old school country music and quirky humour. Indie rockers enjoyed a show from Yukon Blond who returned to Lethbridge for a Feb. 11 show at Average Joes. An early incarnation of Jay Bowcott and Brady Enslen played the Owl Acoustic Lounge.They would return later in the year as Enslow. And speaking of old favourites, Elliott Brood returned to Lethbridge played for full house at Studio, Feb. 12. David Bowie was one of many great musicians to pass away this year, so a group of local musicians including Jon Martin, Taylor Ackerman, Jason Oakes, Clayton Smith and Paul Holden, to name just a few, banded together to pay tribute to his music at the Slice, Feb. 20. For big name country stars, George Canyon returned to Average Joes, Feb. 22 to play a hit filled set. Some bands just click with Lethbridge audiences. Saskatchewan based roots/ bluegrass collective the Dead South have been an immediate hit since playing South Country Fair last year. So they made one of their first visits to Lethbridge, Feb. 25 with an outstanding sold out show at Coyote Joes. They would return in November for another great show. Continuing with the classic rockers go acoustic vein, Ed Kowalczyk of Live played a solo show for the ’90s moment of the month at Average Joes, March 7. He played a whole bunch of hits and Live’s hit album Throwing Copper in its entirety with a spectacular video display. Good things happen to good people. 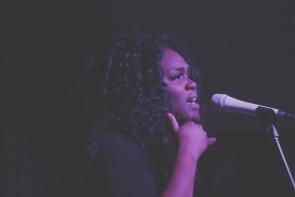 Samantha Martin played an exceptional show of blues at the Geomatic Attic, March 8 with local soul/R and B singer Mwansa Mwansa opening. She made such an impression on the audience and Martin, that she would join Martin on tour in the summer. 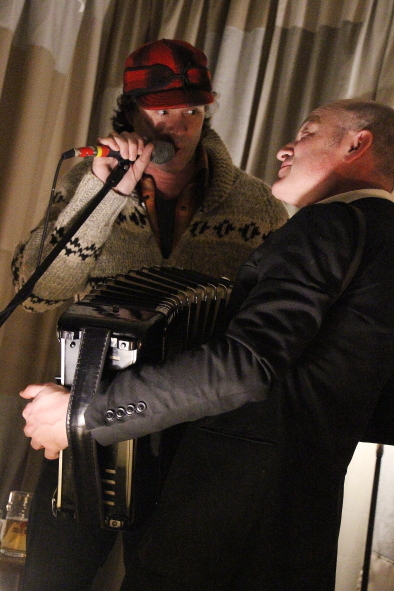 March was marked by a March 11 fundraiser at the Galt Museum for the U of L food-bank featuring Dory and the Weathermen. The next day featured another fundraiser at the owl Acoustic Lounge,March 12. The Cheeky pig Studio Grant event featured Dojo Workhorse, one of Danny Vacon’s many Calgary bands including the Dudes and High Kicks at Owl. And there is always lots of fun during CKXU’s FUNDrive, so it featured several great shows at the Slice and Attainable Records. There was lots of local music for St. Patricks Day including The Silkstones who continue to make an impression on new and old fans alike. And, March ended on a high note as blue rock behemoths ZZ Top played an amazing show at the Enmax, March 31. Lauren Mann played an exceptional show of roots and folk at the Slice as well. For ’90s rock fans, Sloan played a great show , April 11 At Average Joes and played all the hits and more. The day before that, Average Joes hosted country rock musician Cory Marquardt, April 10 who was last here opening for Aaron Pritchett. April 16 was a tough night for attendance. Jen Lane played a great roots show at the Slice. Fernie stoke folk band Shred Kelly, who usually draw a crowd in Lethbridge, didn’t get one April 16 at Studio, but they’d return to play a packed Freshfest at the university in September. On the other hand, people packed the Owl for local jazz/ pop band the Groove Apostles around the corner on the same night. They are quickly becoming one of my local favourites. Also on the poor attendance note, Zoo Riots played the greatest indie rock show that nobody saw at the Slice on April 20. 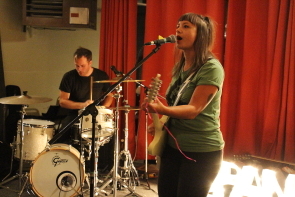 Calgary’s Foul English played one of many excellent punk shows at the Moose Hall on April 22. April was a big month for fundraisers. On April 23 the Smokehouse hosted a big, day long fundraiser for Alzheimer's and Parkinson's featuring Eric Braun, a new Southern Alberta band, Suit Jacket Society, Mark Hall band, Tres Hombres and more. The Girls Rock Camp held a fundraiser the same night, April 23 at the Slice which featured several bands forming in a week and coming up with a short set including bands made up just for the show, including me. People remembered the South Country Fair, so they packed into the Slice for country/ roots band Good Ol’ Goats, April 29 at Slice who were a highlight of the fair last year. April ended with the annual visit from Winnipeg blues rock trio the Perpetrators who played the Slice with a super set of blues and blues rock , April 30. May was a big month for live music. Vancouver indie rockers Said the Whale opened May at Studio with an excellent show, May 1. Inferno featured an excellent punk show, May 7 with the Golers, Sick Ritual and World Class White Trash. Trevor Panczak and Shane Chisholm raised $14,000 for the Red Cross with a show at Coyote Joes, May 14. Another fundraiser at Smokehouse brought in over $3,000 for the Salvation Army to help fire victims with performances by Tres Hombres, Shooting For Mars and Dory and the Weathermen who played a lot of fundraisers this year plus Kelly and the Bastards and the Mark Hall band. A few of my favourites from Electric Eye were Advertisement, Physical Copies, Striker, Napalmpom (who would return to Lethbridge in November), Outlaws of Ravenhurst, Durban Poison, Fist City and Blü Shorts. The Slice featured another candidate for best show nobody came to as the Decoys played a wicked set of addictive pop and rock music, May 18 , immediately appealing pop tinged rock. Royal Tusk, who would visit Lethbridge three times this year, wound up their tour in Lethbridge, May 27 at Studio 54. The Owl Acoustic Lounge featured some choice rockabilly shows including Calgary’s Hi Strung Downers, May 27 and Hamilton’s wonderful Ginger St. James, May 28. She was competing with a big country show with Emerson Drive at Average Joes. They played their many hits. Another show I was looking forward to , but which was unfortunately cancelled due to a car accident, was Tallest to Shortest who were to play the Slice, May 28. They will be returning to Lethbridge in the new year on Jan 27. 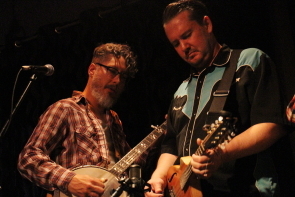 The always fun Calgary rockabilly band Peter and the Wolves opened June on a high note, at the owl Acoustic Lounge June 4. 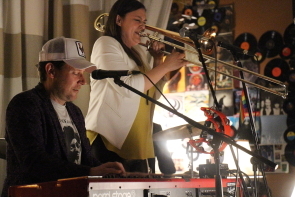 For something special, CKUA featured Dave McCann and the Firehearts for a live broadcast of the Trans Canada Music West concert series, June 10 at Geomatic Attic, which was packed, though their show the week before at the Slice was dead. The Lethbridge Jazz festival expanded this year, unofficially beginning early on June 13 with gypsy folk duo Blue Moon Marquee who played a great show to a decent sized audience, especially for a Monday.